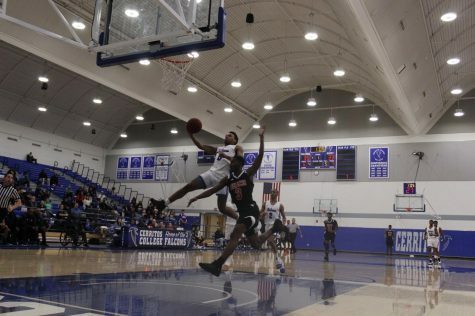 Cerritos College women’s and men’s basketball teams had complete opposite results in respective games versus El Camino College on Jan. 25. 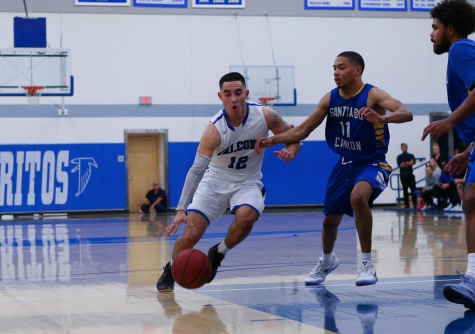 The men’s team won by a whooping 46 points, 99-53–while the women’s team struggled to score in the fourth quarter, leading to a 72-61 loss. The men’s squad was en fuego, shooting a sizzling 59 percent from the field and knocking down 16 3-pointers in the contest. 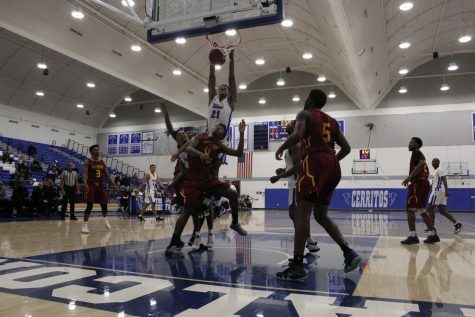 The team also put the clamps on El Camino College defensively, limiting the team to shooting a lowly 27 percent from the field. Men’s basketball is now on a two-game winning streak after coming off a two game losing skid. The team’s record now stands at 15-5, including 2-0 in Southern Coast Conference matchups. Cody Wilkes, sophomore guard, No. 1 lead the charge with 20 points on 8-of-11 shooting from the field, including 4-of-6 from the 3-point country. He also dropped 19 points in the team’s previous win and shot 3-of-6 on his 3-pointers. 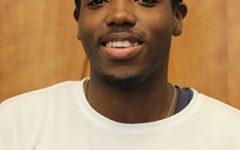 In the rout of El Camino College, three Falcons each tallied four 3-pointers in the box score. Falcons’ women’s basketball struggled to score in the fourth quarter, going 3-of-17 and putting up only six points as a whole. 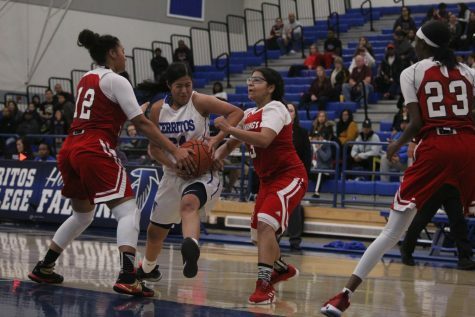 El Camino College’s women’s team scored 15 in that quarter, which proved to be enough to seal the win. With the loss the team is now 12-10 overall and 1-1 in the SCC. Serena Rendon, sophomore guard, No. 24 spoke on he team’s fourth quarter woes, she said the lack of scoring was most likely due to the team being fatigued. Rendon had an all around game, finishing with 16 points, six rebounds and three assists. Rendon lead the team in those three statistical categories as well. Both the men’s and women’s team will face off against Compton College on Jan. 30. The men’s team tip-off at 5 p.m. and the women’s squad get it going at 7 p.m.